Custom Drywall | Acceptable is not enough... good is not enough... it has to be pretty. Welcome to Custom Drywall. We're looking forward to working with you, and working to meet your highest standards. Your project is important to us, and we take pride in our final results. Call us for a free estimate. We love our new basement! Peter doesn't simply do exceptional work, he creates a work of art. We assumed that we would wind up with a nice basement rec room and in that we weren't disappointed. What we didn't expect is that the newly finished basement would be one of the nicest rooms in the house. Thanks, Peter! We live in a loft, open concept, and wanted to build a wall to fully separate the bedroom from the rest of the unit. Peter did a great job, finished on time, and the price was very fair. He is very careful and really cares about doing the job right. We are very pleased with the whole process and would recommend him without reservations. 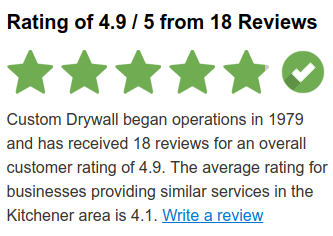 I was very happy with the exceptional job done by Custom Drywall. I can't say enough about the great service, and quality work. Thank you Peter. Our kitchen looks great and you definitely earned my recommendation. Custom Drywall did an excellent job on the drywall and ceiling in my basement. They did the job in the exact amount of time and money that their estimate had said, and their attention to detail and quality was impressive and much appreciated. I have already recommended their services to a few other people.